This Long Island outdoor concert facility was originally opened in 1952 to host musicals. It wasn't until the 1980's that the venue changed its focus to concerts. Each summer, the theater hosts top names in music; capacity is 15,000. You can enjoy a waterfront view too! 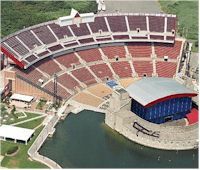 The Northwell Health at Jones Beach Theater is one of the top New York City venues for concerts and other events. Don't miss some of the biggest names in music as they come to New York City area's Northwell Health at Jones Beach Theater to perform live.